Volunteers and members from the community in Kenya gathered together. Photo: /provided By Gary Morello. 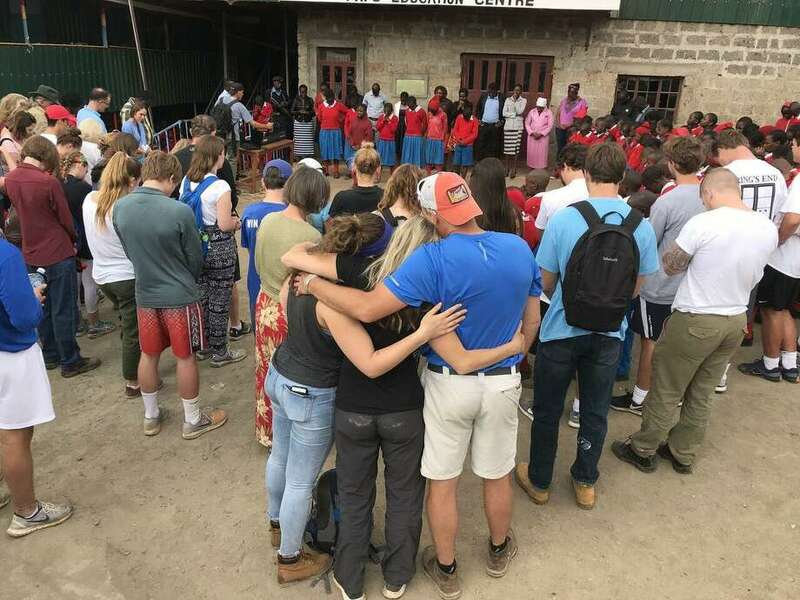 DARIEN — When First Congregational Church members found out a school they spent six months building in Kenya was destroyed in a fire, they were heartbroken. But less than a year later, local volunteers returned to Kenya to rebuild the school — this time in 10 days. With help from the organization Crossing Thresholds, they were able to complete the project in about a week beginning in late June. , and ranged from schoolchildren to adults. Almost 70 people in total traveled to Kenya to assist in building the school; volunteers individually funded their way for the trip. “We had six football players come on the trip, we had college kids come, we had middle school kids come. It was a really beautiful community trip,” Morello said. The school was built in the Kibera Slum, the largest slum in Africa according to Morello. The Kibera Slum is also the second largest slum in the world, he said. Morello said the group didn’t want to just go in and take over the project, but instead worked side-by-side with leaders of the Kenyan community to achieve a common goal. Volunteers woke up early in the morning and were bused to the work site. Once there, they would work with members from the local community, Morello said. Morello said the volunteers managed to hit their week deadline and was able to finish the new school, named Mobjap. “It means garden of hope,” he said. Carter Via, founder and executive director of Crossing Thresholds, said he started the organization in 2008 after a trip to the slum. The trip would go on to have a profound effect on him, Via said, and he has been working to build schools in Kenya ever since. Via said it was important that the project be a collaborative effort with the community, which is why it included a Kenyan community leader and contractor to help head the project. Volunteers worked from 9 a.m. to 4 p.m. to build the school. A handful of skilled people served as supervisors to the work, he said. After the school was built, volunteers and the community celebrated together. Once schools are built, Crossing Thresholds covers the operating budget for the next five years, which can be anywhere between $50,000 to $100,000 depending on the number of students. “The ultimate goal is after the school is built and we’ve supported it for five years the school can stand on its own,” Via said. Crossing Thresholds is planning to build another school in 2019 and plans to add more volunteers.